Panhandle residents Dusty and Nikki Green and their company Stone Ranch Media are excited and proud to announce that the Amarillo Activity Youth Center will be the recipient of half of all profits generated from the sale of Our Amarillo Sod Poodles t-shirts, and that shirts are now available for sale at the AAYC facility at 816 S. Van Buren in downtown Amarillo. The Greens then reached out to Matt Hite, director of the AAYC, and were able to make an on-site visit to the AAYC facility in late December. Hite gave them a personal tour of the facility and introduced them to members of the AAYC volunteer staff, as well as some of the kids who take advantage of the many programs and activities the center provides. And the Greens say their on-site visit effectively sealed the deal for them. Hite says the AAYC, which is located in the old YMCA building downtown, is a 501c3 nonprofit organization that serves and works with hundreds of local youths every year. They have many sports programs including baseball, fencing, tae kwon do, zumba, and personal training, as well as arts programs, community service initiatives, and leadership and mentoring programs. All of which are designed to enrich the lives of the local kids they serve, many of whom come from split homes and “at risk” households. The AAYC also has a food pantry, a clothing closet and a school supply closet as well, which again are all available to the kids at the center. 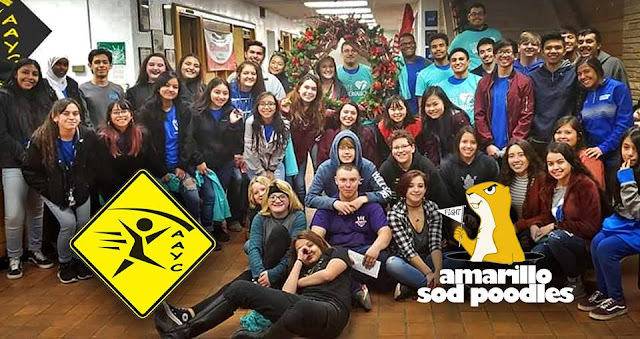 The AAYC runs 100% on volunteers, says Hite, and their entire budget goes to keeping the doors open and getting their volunteer coaches the supplies that they need. Repair and upkeep on the facility is slow because of lack of funds, he says, and any additional funds they collect can go a long way toward fixing the AAYC building, and providing more activities and support for their youth and their families. The AAYC facility is open from 6:00pm to 9:00pm Monday through Friday. Sod Poodles shirts are available on site for $25 each, including tax.